The fervor is mounting as a well-orchestrated hype machine continues to dole out details about this December's release of TRON Legacy, the sequel to the 1982 cult classic about a game programmer transported to the digital realm he created. Building on a previous proof-of-concept and then the same scene recreated as a teaser trailer, a full-length trailer for TRON Legacy has now been revealed. 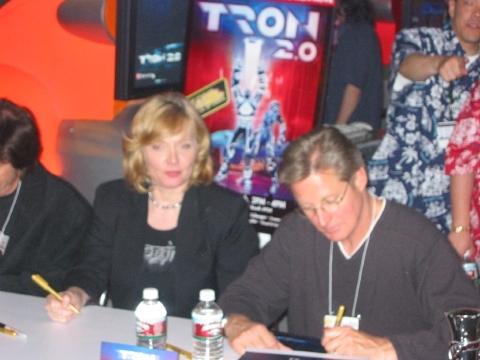 Whereas the TRON 2.0 video game and subsequent comic book starred the son of Alan Bradley (Bruce Boxleitner), TRON's programmer, TRON Legacy appears to focus on the son of Kevin Flynn (Jeff Bridges). This trailer reveals more than just an apparent replacement of back-lit animation with CGI. The plot indicates that, by the time his son comes looking for him, Flynn has been lost in the world of TRON for at least two days. Consider the implications! 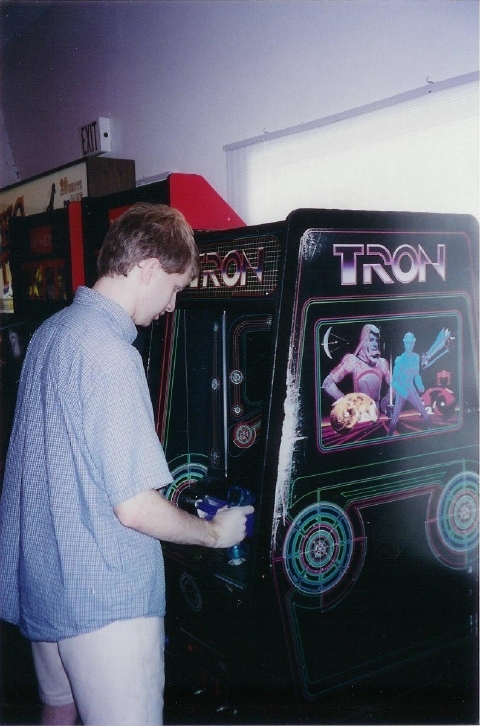 In the 28 years since the original TRON, advances in technology have produced computers that run at 3 GHz and can perform ten petaflops (1015 floating point operations per second). For one's consciousness to exist at that rate for 172,800 seconds would seem an eternity (a concept previously seen in such sci-fi as Star Trek: Voyager). After such a long separation from humanity, Flynn Jr. would understandably find his father older, wiser, and possibly far more sinister. As much as I hate to see heroes become villains — I'm looking at you, Hal Jordan — I recognize that such a plot device can make for excellent narrative. Jeff Bridges and Bruce Boxleitner obviously have faith in the script to have signed on to reprise their roles; we shall know in just a few months whether that faith is well-placed. As with the original film, look for a simultaneous video game tie-in, TRON Evolution, on Windows, Sony PlayStation 3, and Microsoft Xbox 360. And to further explore the concept of life inside your computer, check out the television series ReBoot. Some movie titles are short and descriptive, like Alien or Terminator. Others tell you little about the film, like TRON or Ponyo. Then there are those that are memorable for being nearly complete sentences without telling the uninitiated hardly anything about the film — think To Wong Foo, Thanks For Everything, Julie Newmar. Based on the 2002 book of the same name, The Men Who Stare At Goats is a dark comedy "inspired by a true story" that describes the United States' research into creating psychic soldiers akin to what the USSR attempted during the Cold War. Perhaps "research" is too strong a word, as these recruits seem to have a license to operate without any evidence of their abilities. Watch for this film in theaters on November 6. Filed under Trailers; 1 comment. Although this trailer contains original footage, its script is almost identical with that of the proof of concept video released this past fall. In fact, Apple brands this new trailer as a VFX concept test. I've never known a studio to stick so closely to the same demo. Whereas the film was previously scheduled for a 2011 release, we're now looking at December 2010 — so shouldn't we be seeing new scenes, not rehashing old ones? Regardless of its originality, the above trailer is beautiful and worth watching several times. Accompanying it was the launch of several promotional sites, such as Flynn Lives and Home of TRON. These are just two of many outlets to tide you over until the 1982 film gets the sequel it deserves. Play the game. Read the interview. Watch the RiffTrax. Whatever your choice, I suspect that in a year, we'll learn that it's not so easy on the other side of the screen. Filed under Trailers; 3 comments. You don't need to be a dedicated Showbits reader to have observed my passion for TRON. It was upon its 25th anniversary last year that I reflected: "Computers and electronic games were both still new media back [in 1982]… These nascent industries could've been horribly misrepresented to the unwashed masses, and there surely was a degree of artistic license on [TRON's] silver screen, with its AIs, lasers, and whatnot. But the way its digital society was structured and how software interacted with each other and with their users worked on both digital and HCI levels." I don't know! Whatever made [TRON] not successful in the first place would probably still be present in a remake, if they went with the same story. The fundamental plot devices are anachronistic now, so it'd need to be updated to be Internet-aware, with much less emphasis on mainframe computers and a much higher emphasis on personal computers and small portable devices. You could go in the Matrix direction, where some aspect of his personality is transferred over into the computer and they're linked in a way. Another good sign: IGN recently interviewed Jeff Bridges, who seems genuinely enthusiastic about the project. As Star Trek novelist Dayton Ward told me, "It's neat that he sounds so excited to be doing this. It's not like he needs the money or anything." The IMDb lists TR2N for a 2011 release. I hope that gives the cast and crew time to produce a final product that we, too, can be excited about. Filed under Celebrities; 1 comment. Angela Gunn is proving quite the sleuth at revealing the unpublicized lives of the stars. First she found a list of 66 celebrities who blog (ever wonder what Jamie Lee Curtis, John Cusack, and Jeff Bridges have to say that's [supposedly] unscripted?). Now she's dug up their resumes to reveal their inner nerds — that is, "celebrities who work at traditional artistic pursuits to make their way in the world, but have been known to kick back with a little astrophysics or microbiology in their spare time." Excellent job, Ms. Gunn, for this fun and insightful piece (my contributions to which — Drake Hogestyn and Natalie Portman — reveal perhaps more about ME than I'd like…). In a culture where "heroes" are often such for all the wrong reasons, it's nice to have admirable reasons to respect these stars. Filed under Celebrities, Films; 5 comments. I had to commemorate the anniversary of this cult hit with more than just a marathon session of lightcycling. After reading IGN's interview with Steven Lisberger, Tron's creator, I felt there must be better interview subjects out there. So I instead got ahold of John Knoll, visual effects supervisor at Industrial Light and Magic. ILM was created by George Lucas for the original Star Wars films and has since gone on to become a powerhouse in visual effects. Mr. Knoll has worked on several of their best films, including Willow, The Abyss, Mission: Impossible, Star Trek: First Contact, the Star Wars prequel trilogy, and the Pirates of the Caribbean trilogy. And somehow, during all that, he found time to invent Photoshop. "Even today … filmmakers rely on the special effects to be the only appeal in the movie, and they don't try so hard on the movie because they figure the visuals will carry the film … For those of us who work in the industry, that's not something we encourage. It's just as hard to do the effects on a bad movie as it is the effects on a good movie, and we'd all rather have worked on a good movie." Continue on to Computerworld.com to read the full interview. A huge thanks to old LucasArts and ILM colleagues Tom Sarris and Ellen Pasternack, without whom this interview would not have been possible. Update: the above article has been Slashdotted!